A Saturday morning farmer’s market is just like Christmas morning for us foodies. We get up at the crack of dawn to see what’s under the tree – or in this case, try to beat the rush to our favorite artisan cheesemakers’ stands to discover what seasonal gems are available today. Saturday was the best Christmas of them all at the Dane County Farmer’s Market. Willi Lehner of Bleu Mont Dairy debuted his “Irish Gem” – a one-of-a-kind Willi inspiration that we will probably never see again after this spring’s farmer’s market season is over. 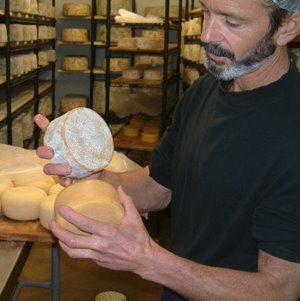 That’s because Willi crafted and aged the cheese using mold from authentic Irish farmstead cheeses he purchased on a visit to Great Britain last year. He used these scraped Irish rinds to wash his own cheddar-base recipe, aged it and voila – a Wisconsin orginial. Upon setting it out at the market on Saturday, he promptly sold out by mid-morning. Even his bandaged cheddar – which has been available for a little over a year – sold out by 10 a.m. In this town, if you’re a late riser, forget about taking any cheese home. Willi does promise he will have more of both varieties at the market this Saturday, so if you’re interested, arrive early.